When George Martinez gets parking tickets in LA, he rarely pays them. "I just throw them away," Martinez told NBC4. "I pay them if I can. If I can't I just throw them away." Martinez is one of thousands of people the I-Team found who aren't paying their parking tickets in Los Angeles, which is against the law. And we found out, cities like LA often let them get away with it. The NBC4 I-Team obtained and analyzed a list of all unpaid tickets in the city of LA. We found there are 123,319 vehicles with five or more unpaid tickets. That's more than $21 million owed to the city by parking ticket deadbeats. An alarming number of people illegally use handicapped parking placards that do not belong to them, but the DMV fails to stop the abuse. Joel Grover reports for the NBC4 News at 5 p.m. on Thursday, June 15, 2017. Because parking ticket revenue helps pay for city services, the rest of us are bearing the cost of those unpaid citations. That $21 million in unpaid tickets would cover the cost of repairing 1 million potholes, or run the LA Zoo for an entire year. "Yes, I know I'm breaking the law by not paying tickets," Martinez told the I-Team. Martinez owns a fleet of trucks that make deliveries for FedEx. Three of his trucks have received 118 tickets in the last five years, none of which he's paid. His drivers are often cited repeatedly — sometimes in the same day — for parking in the red, in front of fire hydrants, and in "No Stopping" zones while making delivery stops in congested neighborhoods like Westwood. "They are breaking the law, but there's no other way for them to do their job," he told NBC4. 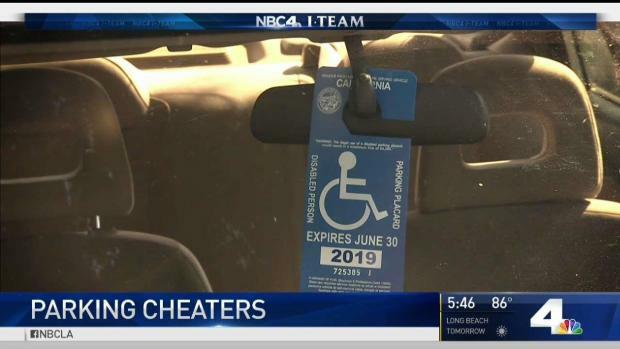 The LA Department of Transportation (LADOT) tells NBC4 when it tickets a car that has five or more unpaid tickets, it has the vehicle towed. But the I-Team has learned George Martinez hasn't had one of his delivery trucks towed since 2011, even though the I-Team found he's been ticketed just about every week since then. Questionable parking tickets will be easier to fight after January since the California Supreme Court ordered the city to have officials review citations rather than for-profit companies. Joel Grover reports for the NBC4 News at 5 on Wednesday, Nov. 23, 2016. And there are other examples of ticket deadbeats getting away without consequence. We identified a 2017 Toyota that's been ticketed 69 times in the last nine months for illegally parking on Cedros Avenue in Panorama City; none of those tickets have been paid by the car's owner. But that car hasn't been towed. LADOT spokesman Deputy Chief Brian Hale says the car should've been towed for all those unpaid tickets. "I'd want to research and find out why that hasn't occurred," Hale told NBC4. LADOT has been scolded before for doing a poor job of collecting unpaid parking revenues. In 2011, an LA City Controller's audit said "LADOT inadequately exercised (ticket) scofflaw enforcement...and [could] significantly increase revenue that is due to the city." When the 2011 audit was issued, the city was owed nearly $15 million in unpaid tickets. That number has risen to more than $21 million. LADOT is about to try a new tactic to rein in parking ticket deadbeats. The department is unveiling a new, lightweight "Smartboot," that will be placed on the wheels of cars identified as having five or more unpaid tickets. Drivers won't be able move their cars until they pay their ticket fines online or by phone with a credit card. Once their debt is settled, drivers will be given a code to unlock the boot. It will be drivers' responsibility to drop the boot off at a specified location. "We're thinking it will make a substantially larger dent than what we've been able to do in the past," Hale said. But for now, it might not make enough of a dent in the $21 million of unpaid tickets. To start, the city's pilot program will issue the Smartboots to just 15 of its 500 parking enforcement vehicles. If the program is a success, LADOT says the boots will be given to many more parking enforcement officers. As for Martinez, after the I-Team told him he'd be featured in this investigation, he said he'd consider paying at least some of his 118 unpaid tickets. He'll also have to deal with FedEx, which contracts with him to do deliveries. In a statement to NBC4, FedEx said "We are in direct contact with those involved and will take the appropriate action to address this matter."